Indoor and outdoor digital signage are both ideal mediums to engage people, but there are some unique benefits with indoor LED video walls. Let’s breakdown the differences between the two. In sports, it’s not enough to create a brand, you need to create a brand experience that will keep fans engaged. 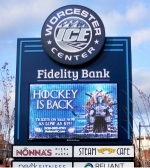 LED video displays have become a powerful and profitable way to create an experience that engages fans and develops lasting and meaningful relationships with the brands of sports franchises, facilities and events. In the 1980s, the kiss cam was a sensation that swept through professional baseball stadiums. It was a light-hearted diversion during TV timeouts, and an unexpected way to take advantage of video displays. Decades later, the kiss cam has become an indoor and outdoor sports tradition.